Dude, we have a charter boat! Our charter boat, historic boat lift facilitates, ship’s crew and town party. 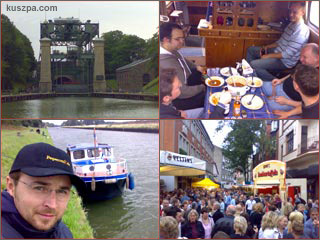 With the charter boat we travelled on the Datteln-Hamm-Kanal and Dortmund-Ems-Kanal. On the way we saw e.g. the coal-fired large-scale power plants „Kraftwerk Westfalen“ and „Kraftwerk Datteln„. In the sluices parc Waltrop we saw some modern boat lift facilitates and had also a look on the historic Henrichenburg boat lift facilitates. In the evenings we went to Hagen-Hohenlimburg Festival 2007 with a wide entertainment programme. On such town parties it’s quite funny to meet people, e.g. from school, that you haven’t met for years.